On April 25th, thousands in Berlin rallied for the "Berlin Tragt Kippa" or "Berlin Wears a Kippah" march. The march had been called after an Israeli Arab Christian had worn a Kippah, a Jewish religious head covering, to test the level of anti-Semitism only to be violently attacked by a Syrian Muslim refugee screaming anti-Semitic slurs. The video of the attack went viral and the march went viral too. People of good will wore kippahs, took selfies and no one was assaulted by a Syrian refugee. In June, the perpetrator, Knaan al-Sebai, pled guilty to the attack. He claimed that despite screaming “Jew” in Arabic at his victim, often used as a slur in the Muslim world, he wasn’t anti-Semitic. Instead he blamed hashish and exhaustion. Despite being 19-years-old, Al-Sebai was sentenced to 4 weeks in juvie. In Germany, if you’re under 20, you too can be treated as a juvenile after a violent anti-Semitic attack. 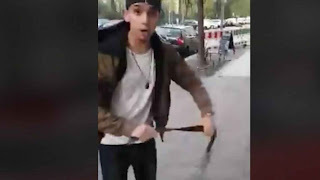 The Syrian-Palestinian migrant "fell out of the nest too early and had not yet learned to properly fly," Judge Günter Räcke tenderly summed up the violent assault by the adult man. Judge Räcke diagnosed the violent criminal with a bad case of frustration. Jews were just an outlet for his “bad mood”. The job center had cut off his support. When he attacked the man he thought was a Jew, he “felt that he was in the right. That’s a powerful thing.” Indeed it is. Just ask any Nazi. Knaan al-Sebai had assaulted his victim with a bottle and a belt. He would later claim that despite the assaults, "I did not want to beat him, I just wanted to scare him." He also screamed anti-Semitic slurs at the Arab Christian veterinary student. When a local German woman told him that you can’t behave this way in Germany, he had shouted back at her, “I don’t give a damn. I’m Palestinian. " Instead of sending him to jail, Judge Räcke sentenced the anti-Semitic thug to take a tour of the House of the Wannsee Conference; the lavish mansion that hosted the Nazi conference plotting the extermination of the Jews. A location frequently visited by Jewish tourists. “It’s not an extended civics course,” Judge Räcke said. Just so he’ll understand why everyone is so upset. Any Jews or Christians whom he may or may not attack in the future share the same hope. Since El-Sebai had been held for two months before trial, he walked away with time served. And now he’s suing for compensation over the extra days that he was held in custody while awaiting trial. The Syrian refugee would like 950 Euros or approximately $1,000 from Germany. And he’s also appealing the conviction. Since his original viral assault, there have been a number of anti-Semitic attacks in Berlin. One of the weapons of choice of the Arab Muslim attackers was a broken bottle. Also in June, a 14-year-old Jewish girl was murdered by a Muslim refugee in Germany. Last year there were 1,453 anti-Semitic attacks in Germany. There are only around 100,000 Jews in Germany. Many of them have only a limited Jewish ancestry, don’t identify as Jewish and wouldn’t be likely to be singled out for anti-Semitic attacks. The official Jewish community in Berlin numbers 10,000. It’s when we compare 100,000 Jews to 1,453 anti-Semitic incidents that we can see the problem. The United States averages fewer anti-Semitic incidents per year, in a country with between 4 to 6 million Jews, than all of Germany. Even in the UK, there were 1,382 incidents in 2017 in a country with 263,346 Jews. Why is Germany so much worse? The court case of Knaan al-Sebai and its aftermath, the Kippah march and Judge Räcke, along with Merkel’s open borders policy for migrants like Al-Sebai, hold the answer. The kippah worn by the Arab Christian veterinary student when he was attacked was put on display in the Jewish Muslim of Berlin. It’ll become part of the museum’s permanent collection. 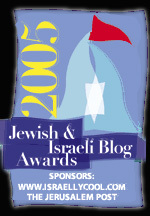 And like the kippah march, the resort to virtuous symbolism misses the real point. Anti-semitism isn’t an abstraction. It’s not a theory or a symbol. It’s what happens when violent thugs like Knaan al-Sebai are given a pass for attacking Jews. The museum’s new permanent display will open in 2019. But El-Sebai was out in a few months and may yet end up making a thousand bucks out of it. Last year, a German regional court ruled that an attempted firebombing of a synagogue by three Muslim men wasn’t anti-Semitic, but had been carried out to draw “attention to the Gaza conflict”. The anti-Semitic arsonists, two Muhammads and an Ismail, blamed alcohol and marijuana, and received suspended sentences. The Knaan al-Sebai case wasn’t atypical, it’s typical of what happens when the occasional anti-Semitic Muslim attacker is actually put on trial in Germany. His lawyer invariably blames drugs and alcohol. A sympathetic judge finds every possible excuse for the attack and lets him off with a slap on the wrist. But not before the judge condescendingly urges the thug to understand the morally superior position of Germany on anti-Semitism, while at the same time excusing him for not yet adapting to German mores. Judge Räcke sending Knaan al-Sebai to learn about anti-Semitism at the House of the Wannsee Conference is typical of the preening moral superiority and the anti-Semitism of the authorities who want to be seen as condemning anti-Semitism even while they actually collude with anti-Semites. That doesn’t only happen in Germany. But it has become ubiquitous there. The Knaan al-Sebai attack has become a symbol of the hollow self-righteous posturing and its ugly aftermath. The German authorities pay lip service to symbolic events like the Kippah March even as the attacker who was behind it was quickly set free and may even yet be rewarded for his crime. Germany condemns anti-Semitic violence in word and condones it in deed. 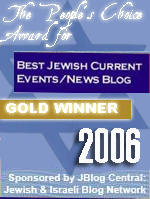 Anti-Semitism is widely condemned and condoned in Europe. It’s hard to find any mainstream European politician who won’t condemn anti-Semitism, at least in the abstract, but finding real enduring consequences for anti-Semitic Muslim attacks short of outright murder is often equally elusive. European politicians condone every display of anti-Semitism up to actual physical violence. And European courts condone anti-Semitic violence up to actual murder. And sometimes even then. The attack by Knaan al-Sebai has become a symbol of overt anti-Semitism in broad daylight. But it’s also a symbol of covert anti-Semitism. And we cannot understand the one without the other. Muslim anti-Semitism is not organically part of Europe. It was covertly brought there. It was covertly cultivated there. And it is being covertly protected, as Knaan al-Sebai, was protected. When Muslim migrants swarmed into Europe, the authorities promised that they would do the jobs that Germans didn’t want to do. Very few of these refugees have taken on gainful employment. But refugees like Knaan al-Sebai are hard at work doing the jobs that Merkel and some other Germans don’t want to do. Merkel is a DISGRACE!! Why hasn't Germany dragged her out of office! She has been the worst thing to happen to Germany since WWII!! It's called tolerating intolerance in the very name of tolerance. Shame on the Europeans for allowing their Jews to be subjected to this. It's the 1930s all over again in Europe. Good points. German antisemitism is such a touchy subject it is hard to discuss. But I think you are on to something, importing muslims has the covert effect of legitimizing latent German antisemitism somehow. Well, could write volumes, but just one thing my grandmother said to me when I was a kid, the reason the Germans are antisemitic, is that they feel they are inferior to the Jews. There is more to it than that of course, that was in part just meant to be a clever line. The only viable deterrent to violent Jew-hatred is physical violence against those who perpetrate these antisemitic acts! Yes indeed; biblical justice of "..an eye for an eye.." is the only lesson these Arab jihadi wannabes will understand. Particularly in Germany where pre-WW2 street violence against der Juden became " acceptable " behavior, history repeats itself. The formation of a Jewish self-defense group is needed....Now! There is no reasoning with people who have no reason other than their own self-righteousness and assumption of what belongs to God alone. We all must understand what is going on here, and Danial alluded to it in his last sentence. The Germans are having the Muslim imports perform the “job” they are unwilling or unable to perform. And that work, that job, is the active public expression of Jew hatred that is now to be subcontracted to the Muslim imports. The Germans may generally not be conscious of this intent - - though some certainly are- -, but this is the reality of the situation. Apparently many Germans don’t have the stomach to display their age-old Jew hatred , but their subcontractors have no such inhibitions. But the Germans better be mindful that though the Jews may be #1 on the Muslim hit list, they hold no love for Germans, Europeans, or Christians either. The German brand of Anti-Semitism has led them down the road to perdition before, and could again as they turn Germany into another Middle Eastern hell hole. SEIG HEIL, GUNTER RACKE. EIN REICH, EIN VOLK (DEN MUSLIM), EIN FUHRER - KHAMEINI ! Isn't it interesting that wherever Moslems immigrate violence, intolerance and antisemitism follow and it's only going to be getting worse.